Dallas Mavericks owner Mark Cuban disputed a report by ESPN’s Chris Broussard that Cuban was “begging” members of DeAndre Jordan’s family for the address of Jordan’s Houston home. The morning after DeAndre Jordan reversed his commitment to the Dallas Mavericks and opted to sign with the Los Angeles Clippers, Dallas owner Mark Cuban disputed a report by ESPN’s Chris Broussard about the events of Wednesday night. Broussard reported that Cuban was “beside himself” and “begging” members of DeAndre Jordan’s family for the address of Jordan’s Houston home while driving around the city. Deadspin reached out Cuban through Cyberdust, the messaging app Cuban owns, and asked him about the report. 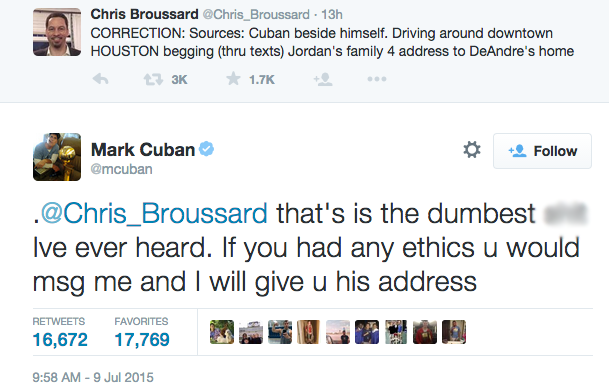 Cuban then addressed Broussard directly on Twitter and the two had a brief back-and-forth. After not getting a response from Broussard in over four hours, Cuban upped the ante. Jordan had reportedly committed to sign a four-year, $80 million contract with the Mavs last week before beginning to doubt whether he wanted to leave Los Angeles.